If you have dry, damaged hair, a quality hydrating shampoo can provide the solution you’ve been looking for. It can moisturize and replenish your hair, leaving it soft, smooth, shiny, healthy, and manageable after every shower. It can also help prevent further damage by deeply hydrating your locks, without ever weighing them down. The moisturizing, color-safe shampoo is a Total Beauty “Top-Rated Beauty Product” and is recommended by Rank & Style and AllWomenStalk. It is also recommended by professional hairstylists around the country for all hair types, particularly for dry, damaged, and color-treated hair. The Neutrogena Triple Moisture Cream Lather Shampoo can renew your hair by gently dissolving impurities. The revolutionary cream formula is scientifically proven to improve hair after just a single use. The panthenol and naturally derived extracts (olive, meadowfoam seed, and sweet almond oils) can penetrate to intensely moisturize each layer of the hair strand. In fact, it has triple the moisture abilities of a standard shampoo. It will leave your hair soft, smooth, silky, shiny, and manageable. It works on all hair types, including color-treated and over-processed hair because it is ultra-gentle and deeply moisturizing. Most reviewers love the salon fragrance. This is recommended by Total Beauty, Rank & Style, and AllWomenStalk, as well as by salons across the country. This pack of three shampoos should last you awhile and offers an incredible value. If you only want to try one bottle for now, consider the Neutrogena Triple Moisture Cream Lather Shampoo, which doesn’t offer quite the same value as the three-pack. The Aveeno Nourish + Moisturize Shampoo is like food for your hair and can help you achieve instant results. It cleanses, soothes, moisturizes, and repairs dry, damaged, or color-treated hair, while reducing frizz and split ends. The exclusive Active Naturals formula is infused with essential conditioners and moisturizers, nourishing wheat complex, and hydrating oat protein. It is scientifically proven to nourish and repair dry hair in only three washes and is designed to target and fortify the areas of your hair that need the most moisture. It will leave your hair full, soft, smooth, shiny, strong, silky, healthy, and manageable without ever weighing it down. The Aveeno brand has been dermatologist-recommended for more than 60 years. This hydrating shampoo is recommended by Total Beauty, Real Simple, and Rank & Style. It also has outstanding online reviews and reviewers tend to love the scent. The Matrix Biolage Ultra-Hydrating Shampoo is a daily use shampoo that gently cleanses, recharges, and nourishes hair with intense hydration. It is inspired by the aloe plant, which never seems to dry out. It has ultra-moisturizing ingredients, like a botanical complex of lemon grass, wheat germ, sage, seaweed, rice proteins, and omega-3s, which can help absorb and retain moisture to improve the hair’s hydration levels. It can also prevent split ends and protect the hair from everyday damages like hair products and chlorine. It will leave your hair silky soft, shiny, smooth, healthy, manageable, and tangle-free after every shower. It is ideal for all hair types, including very dry, stressed, coarse hair. Reviewers tend to love the fragrance. This is recommended by Real Simple and Rank & Style. It also has outstanding online reviews and is recommended by professional hairstylists around the country. The Moroccanoil Hydrating Shampoo gently cleanses hair and infuses it with replenishing nutrients. The moisturizing formula contains antioxidant-rich argan oil, vitamins A and E, and red algae to repair damaged hair and maintain its natural moisture balance. It is designed to improve the health and beauty of your hair, leaving it soft, smooth, shiny, tangle-free, and manageable. The high-performance formula will deeply moisturize and condition your hair, improve hair texture and elasticity, and fight free radicals to reduce the effects of hair aging. The sulfate-free, phosphate-free, paraben‑free shampoo is color-safe and ideal for thick, dehydrated hair. Reviewers tend to love the scent. While this is on the pricey side, most reviewers tend to agree that it is well worth the cost. The brand is recommended by Total Beauty and countless salons across the country. If this one doesn’t work for you, consider the Moroccanoil Moisture Repair Shampoo. 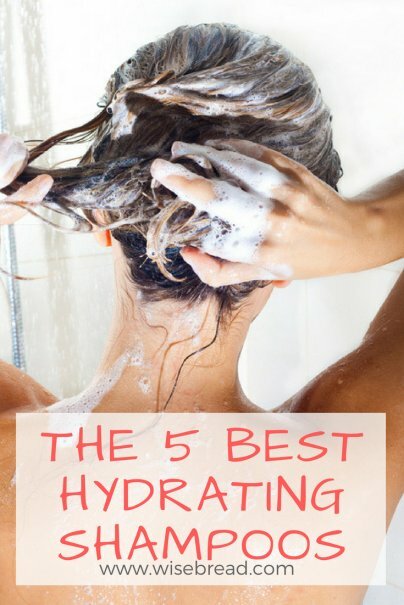 And those are our recommendations for the best hydrating shampoos. As always, be sure to check Wise Bread's Buying Calendar to learn when and how to buy just about anything!